As third and fourth grade students folded paper into kites, Katelynn Moats fielded questions about the location of extra supplies and assisted the students who needed help. "Fold it over like a diamond, like that. Got it?" she said to one student. Moats, a sophomore math education major at Indiana State University, is the student director and coordinator for the math program Go Figure, sponsored by the Indiana State University Center for Mathematics Education and the Terre Haute Children's Museum. The program, which takes place on Thursday evenings from Feb. 4 to March 18, encourages students to get excited about math. Moats, a Terre Haute native, spent about a year planning the project with Patty Butwin, chair of the ISU Center for Mathematics Education. Together, they brainstormed ideas that would engage the students in math in fun and exciting ways. "We want them to see that math is all around them, in everything they do," Butwin said. Moats also recruited eight other ISU students to work as leaders for the groups of children, assisting them in their activities. The university students show the children that it is possible to enjoy math. 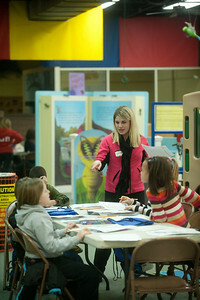 Throughout the six sessions, the children will read two books, make crafts and participate in math-related activities. Zach Duncan, a fourth grader whose favorite subject is math, enjoyed reading the book, "Ben Franklin and the Magic Squares." "I want to come back next time because it's fun," Duncan said. "It didn't seem like we did math." During a recent Thursday evening, the children used measurements when making their kites from paper and ribbons. With 33 students enrolled in the Go Figure program, Moats and Butwin had to be creative in planning the 90-minute weekly sessions. They chose activities that are hands-on and interactive, with topics ranging from Benjamin Franklin to agriculture to the United States Census. "I wanted to do something that would make a difference," Butwin said. Though Moats has devoted much of her time in the last year to planning this program, she has also found time for two internships, a full course load, various tutoring sessions with younger students, a part-time job at Baesler's Market and her sorority, Chi Omega. "I love working with kids, absolutely love it," Moats said. "Even when it's chaos, it's still fun." Katelynn Moats is the student director and coordinator for the math program Go Figure at the Terre Haute Childrenâ€™s Museum.